Undoubtedly, the Goods and Services Tax, popularly referred to as GST, is one of the most remarkable historic reforms in the effort to bring the entire nation under a single tax regime. The earlier taxation system was mainly divided into two major categories- Direct Taxes and Indirect Taxes (Excise Duty, Sales Tax, Local Body Tax, Customs Duty, and Service tax), depending on whether the tax burden is borne by the payer directly or shifted to others in the value chain. This taxation system ultimately led to the tax on tax cycle resulting in increased cost of all goods and services. Thus, GST is a move to merge the taxation system to make it simpler and more effective. So, basically with the notion of ‘one nation, one tax, one market’, GST will subsume the indirect taxes both at the central level and state level. These alterations have impacted every sector of the economy and have also ensured in bringing every business under the tax net. The Indian manufacturing industry has emerged as one of the high growth sectors in India, and the launch of ‘Make in India’ initiative further propelled and gave this sector the necessary boost. According to the Global Manufacturing Competitiveness Index published by Deloitte, India is expected to set its global mark by becoming the fifth largest manufacturing country in the world by the end of the year 2020. In addition, the Government of India has set an ambitious target of increasing the GDP share of manufacturing industry from its current stagnant 16% to 25% by 2025. So far, the complex tax structure has been one of the main reasons affecting the progress of the Indian manufacturing sector. 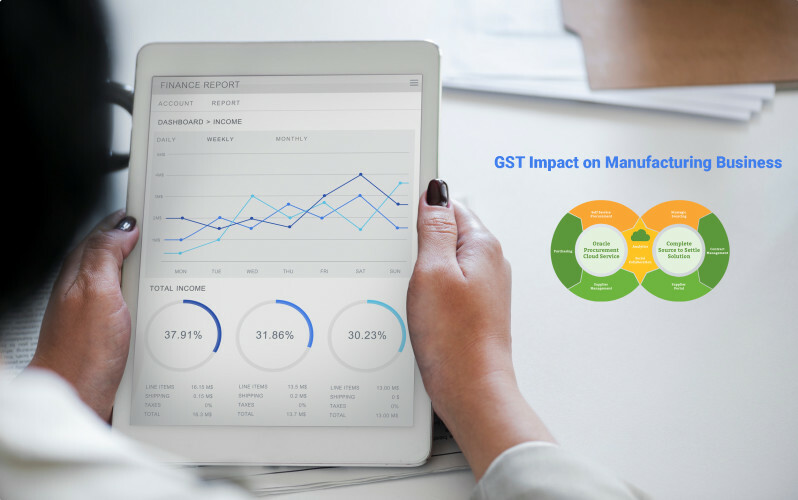 But, the implementation of the unified tax system – GST, the manufacturing sector is set for an overall revival impacting factors such as production cost, operation cost, logistics cost, and time and compliance savings. Reduced cost of production - As GST subsumes various types of taxes, it will directly have its impact on reducing raw material cost and production cost. Additionally, easier tax credit system will drive better accounting and cash flow for the organisation. Reduced transportation time and cost - The GST system will result in a smooth and hassle-free flow of goods within the country by removing multiple checkpoints and permits at state border checkpoints. It is anticipated that by unifying the domestic market, almost 60% of logistics time and effort will be saved resulting in faster delivery of goods. Restructuring of warehouse - So far, manufacturers used to set up a local warehouse to save cost incurred due to the state based indirect tax system. But, with GST coming into play, manufacturers can relax themselves from setting up local warehouses and utilise that cost towards capacity building. Also, by consolidating warehouses or by building larger warehouse facilities, the organisations can save on IT costs incurred by deployed ERPs at many small warehouses. This will considerably reduce the cost of the overall supply chain. Removal of area based exemptions - The GST model will consider the entire nation as one market thereby absolving the area based incentives. This will attract businesses to all locations. With the above-mentioned alterations, the cost of manufacturing goods is expected to reduce while the consumption is expected to rise. It is also expected that India’s GDP will see a growth by 1-2% with the proposed GST. This indicates that it is a good time to invest in a manufacturing business either by taking a business loan or a commercial loan or expanding the existing business. The business loan or commercial loan can be utilized for various purposes, such as expansion, infrastructure, working capital, and other business requirements. Finally, the GST structure has the potential and is anticipated to be the game changer for the Indian economy by providing the manufacturing sector the much-needed thrust to make its place in the global market.